As an artist, a personal website makes for a fantastic portfolio. You can showcase your past work, announce upcoming shows, and even let people purchase some of your pieces on the spot. Being found online with great SEO is only half the battle, however – visitors must be intrigued by your website if you want them to stick around. To stand out from the pack, create a website that lets your artistic style shine: fortune does favor the bold, after all. 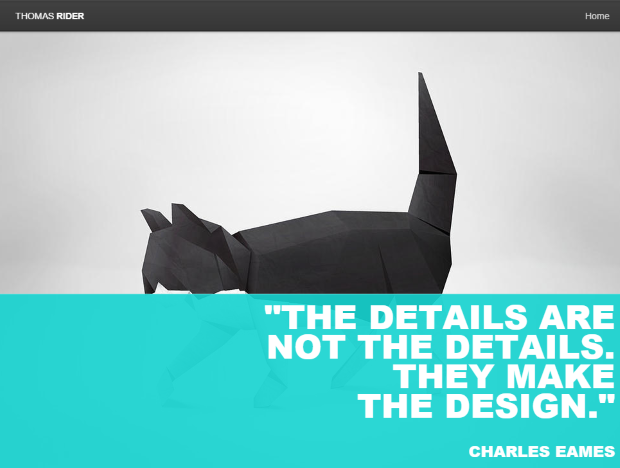 Portfolio website templates worth their salt should have plenty of room for images. Unlike a blog or company website, which may be text heavy and require only thumbnail images, your artist website should put your work front and center in a very visual way. 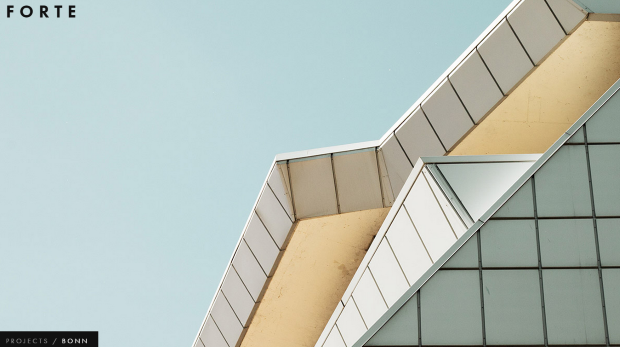 To that end, look for a website builder for artists that offers templates with options for one or more substantial header images. Also, don’t clutter your site with lots of subpages – just stick to the basics. Contemporary means striking colors, clean lines, and often a minimalist approach to additional pages. Sleek lines and an opportunity to showcase art make this creative portfolio an excellent option for any artist. Whether you are a photographer, painter, or an artist of any kind, this template puts your talent on display with a slideshow header. Add your favorite quote, a personal motto, or the tagline to your studio in the provided space just over your slideshow. Best of all? This template makes it simple to showcase your four most recent or favorite pieces on the home page of your website. This template by WIX offers plenty for someone who wants to create an artist website that’s unique and visual. In fact, the template gives you nine spaces for images on the home page. Your art will be the centerpiece of your site, with additional pages for contact information and text about your history, style, and anything else you want visitors to know about your craft. The simplicity of this template is what makes it so contemporary, and what will draw visitors to ask for more details about your work. The Forte template by Squarespace takes the concept of an art showcase to a new level. Nearly the entire first page consists of a slideshow of your work – a bold choice to be sure. Feature cutting edge, emotionally moving pieces for your slideshow and you can really get an art critic’s attention. This template has a place for a blog, so if you want to keep fans or buyers apprised of your latest adventures or work, it’s easy to share. 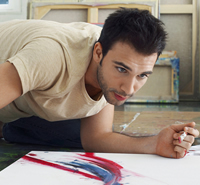 Contemporary artist templates set your website up for success. By showcasing your art, letting the public know a little bit more about yourself, and creating a striking space on the web, you can take the art world and Web by storm. 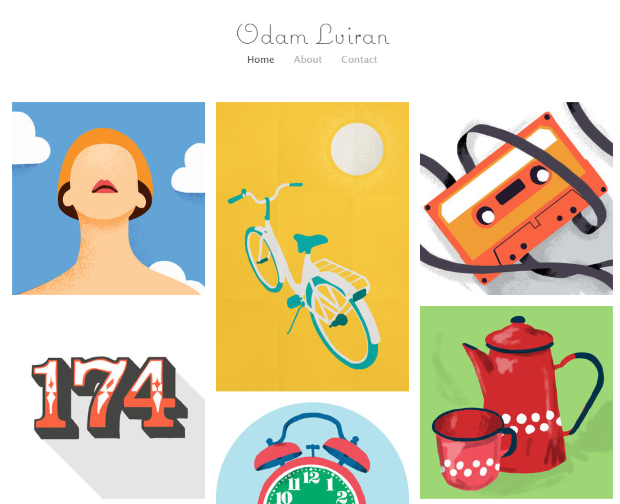 When in doubt, play with your online portfolio until you get it just right. Many online templates for artists are easy to edit and include drag and drop imaging capabilities. Even if you’re a novice at creating an artist website, you can have an artist portfolio up and running in no time! These are just a few of the template designs. Browse other portfolio website templates to help choose the one that’s best for you.